At most points of the Martis Camp compass, the waft of pine and sage and freshly mown fairway rule the airs. Then, inevitably, the works of the culinary team take over as you bike past the Family Barn and catch wind of a barbecued burger and later as you detect the aromas of something exotic in the dinnertime skies near the Camp Lodge. Dining at Martis Camp is as beautiful as Camp itself, creations that are seemingly right on cue and perfectly prepared. At the Camp Lodge, you can enjoy casual dining at the bar, the outdoor terrace overlooking the 18th fairway, or the men’s and women’s locker rooms—in front of the TV. The Family Barn also offers lunch and dinner for the whole family or join us at Lookout Lodge for comfortable breakfast, lunch and dinner. The Camp Lodge has several elegant dining rooms, each with its own character and charm. One of these venues — the Cliff Room — is perched upon the 70-foot outcrop overlooking the 18th green—providing captivating views year-round. 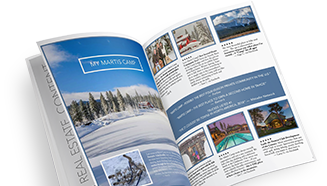 Call us today at 1-800-721-9005 to discover how our array of engaging lifestyle amenities have created a truly unsurpassed Tahoe experience at Martis Camp.